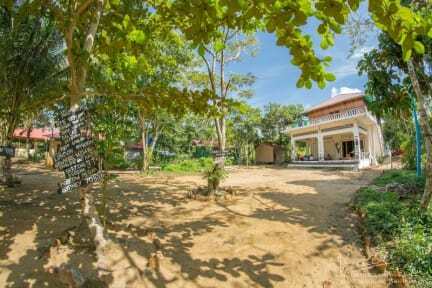 Welcome to Coast 23 Hostel & Bar, a community driven hideaway on one of Cambodia's most beautiful and untouched islands. Ideally situated on the edge of 'M'Pai Bay' fishing village and the unspoiled and famous 'Plankton Beach', Coast 23 offers its guests a true island retreat. From sipping cocktails whilst lounging in your hammock with your favourite book in hand, to enjoying and meeting new, like minded travellers during one of our many happy hours, you're sure to find something which makes you stay that one extra day! The island of Koh Rong Samloem is just a short hop on one of the multiple speed ferry routes from the mainland of Sihanoukville or our big brother of an island, Koh Rong. Coast 23 Hostel offers clean, comfortable and affordable community living on a true paradise island. Inbetween relaxing or exploring, Mama and the rest of the Coast 23 family is here to cater to all your culinary needs, providing both local and western infused delights to suit every palette. A range of activities are possible on the island of Koh Rong Samloem, these include; jungle trekking, scuba-diving, day and night fishing trips, kayaking and much, much more, which can be organised through any one of our friendly staff members. Please bear it in mind that you will be leaving the technologically overwhelming mainland behind you, ATM's and readily available WIFI will be few and far between, this is your chance to reconnect with nature and those around you! Had the best experience here!! Amazing staff, super friendly and so helpful. I booked for 1 night and stayed for 7! The bar was so fun at night, always got everyone involved. Great location, right on the beach, definitely recommend!! Staff are always willing to lend a hand and are actually super cool people! Awesome location right by the water, solid community vibe, and fun beach style living. Would definitely recommend! Great location, friendly staff, comfy beds and good happy hour deals. Shout out to Mudd for recommending the place and making us feel so welcome. Can't wait to return someday! The definition of chilled. Perfect location. Wonderful staff. Planned on one night there which soon became two then three then four. Lovely people, great atmosphere. A home from home tucked away on a beautiful island. My stay at coast 23 was amazing, I just kept extending my stay. The staff are all incredible and super approachable for any questions, advice or problems. Theirs no lockers but everything is very secure and safe. The bar is excellent for meeting others and having a chat with the staff. Super spacious dorms and an amazing location on this island in paradise. A home away from home - the staff here were amazing, shout out to Charlie and Sunni who made the whole experience an absolute pleasure. Can't recommended this place anymore if you want to get away from it all but also want some good laughs. Thank you. The staff here all seem to be volunteers and they're all very friendly. The whole island is very laid back and this place is also super chilled. It is very bare though - the bathrooms are just a toilet and a shower head, so the floor is constantly wet, and there's not even a sink to wash your hands. There doesn't seem to be much going on at the hostel, especially compared to the one next door who had bonfires and themed nights on every day. Also they don't have WiFi!